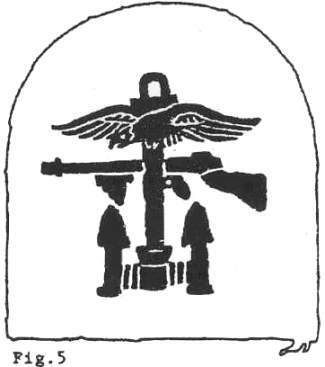 The designer of the Combined Ops badge, Lt D A Grant, could not have known his design would spread around the world or that it would endure to the present day. On 13 Jan 42, Lord Louis Mountbatten, Chief of the Combined Operations Command, requested designs ideas for a badge to represent the Command. It was an open competition and from the many designs received, one of several submitted by Lt D A Grant, RNVR, of HMS Tormentor, a landing craft training base in the south of England, was of particular interest. 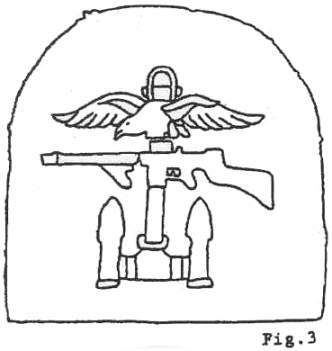 In his submission, Lt Grant provided a number of symbols that might be used to represent each of the three services. The symbols where: Navy - fouled anchor, naval crown, ship or landing craft; Military - crossed sabres, daggers and guns, tanks or Tommy guns; Air Force - Eagle, Aircraft silhouette or propellers. 2 The gold bullion version as worn within the Royal Navy. Wartime economy versions exist with the design worked in yellow threads on navy blue cloth. 3 The Embroidered red on navy blue 'tombstone' version. 4 The circular red on navy blue badge. 5 The light blue on white embroidered 'tombstone' version worn in the Royal Navy. 6 The printed ordnance issue red on navy blue 'tombstone' version, referred to in the text as '291A'. 7 The light blue on white printed version on a square background, referred to in the text as '292B'. 8 The red on navy blue printed circular version referred to in the text as 291A. 19 Feb 42 designs were approved. Lord Louis Mountbatten is very pleased with your design for the Combined Operations Badge, marked 'B'. Would you please have two cop1es of this done, as early as practicable, in red and blue. I will then have them photographed. 22 Apr 42 Proposals were put forward for wearing the CombinedOperations Badge. 24 Apr 42 Sample badges were embroidered. It was also suggested at this time that the only way the manufacturers would be able to produce the required number of badges within a reasonable time was by having the badges printed, which were considered to be indistinguishable from the embroidered version at a distance of about ten feet. 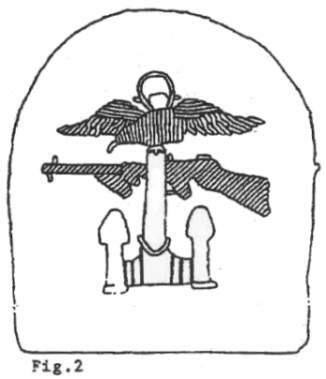 29 Apr 42 The badge, as described by Lord Mountbatten, consisted of a "Tommy" gun, an eagle and a stockless anchor, representing the Army, the Royal Air Force and the Royal Navy. 12 Jun 42 Badges were in the process of being manufactured. 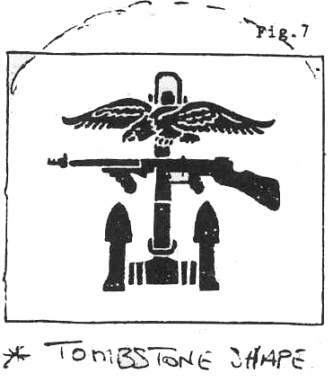 16 Jun 42 Letter from Captain J N Knox, RN with a request for alterations to the design of the badge: 1) that the bird should resemble an eagle and not a seagull and 2) the Tommy gun should face the opposite way, if not too late. 23 Jun 42 An extract, reproduced below, from a letter in answer to these suggestions. The letter was addressed to Captain J. N. Knox, R.N., Combined Operations Liaison Officer, C/O British Joint Staff Mission, Washington, DC, USA. 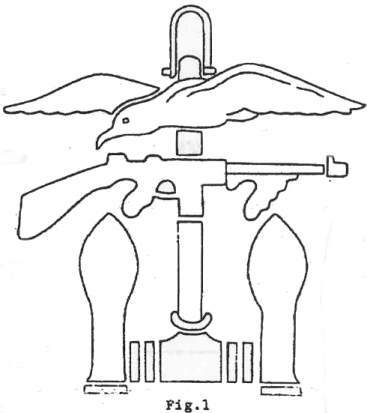 As regards the Combined Operations Badge, I always intended that the bird should be an eagle and I think it is shocking bad work on the part of the artist that has made it look like a seagull, I will arrange, if it is not too late, to get the bird to look more like an eagle and send you a copy. I also agree to changing around the Tommy gun if it is not too late. 24 Jun 42 Combined Operations Headquarters received a letter of this date from the War Office, Hobart House, Grosvenor Place, London, SWI requesting two specimens of the Combined Operations Badge. It vas also pointed out that under authority of Army Council Instruction (A.C.I.) No 2587 of 1941 they were required to obtain two badges from each formation. 4 Jul 42 Authority has now been granted for the issue of the Combined Operations Badge. 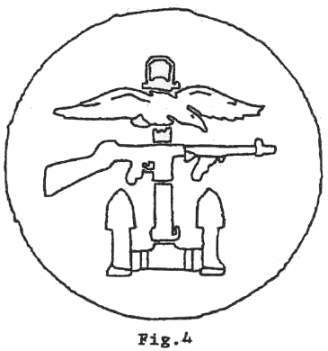 10 Jul 42 New design for the Combined Operations Badge received. 11 Jul 42 Captain Knox was sent three copies of the new design, with a letter from Lord Louis Mountbatten, in which he mentioned: Would you please make sure that the Americans concerned are given this new design which I hope will please them. 27 Jul 42 The first order of Combined Operations Badges for the Royal Navy, including stocks of each of the three pattern numbers given to the badge: 291A (produced in pairs) red on blue, 292A (single badge) red on blue, 292B (single badge) blue on white, 291A similar to number 292A but produced in pairs, for wear by those naval personnel attached to Combined Operations organisations who wear battledress. 5,000 pairs. 292A for wear on the blue jumper 1.5 inches above the right cuff, 100,000 items. 292B for wear on the white uniform, 50,000 items. Men entitled to wear these badges were to be issued with two pair 291A, two badges 292A or two badges 292B. Replacements available 2 pence a pair obtainable from HMS Quebec. Purchase of these badges other than from official sources is prohibited. 24 Aug 42 A letter to Dwight D Eisenhower, Commander-in-Chief United States Army, European Theatre of Operations, 20 Grosvenor Square, London, WI. 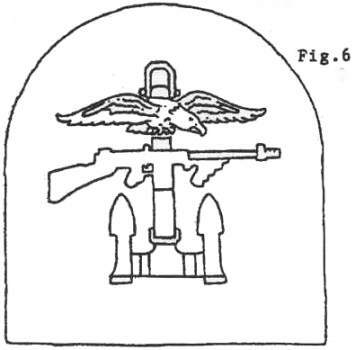 I enclose a specimen of the Combined Operations Badge which it is proposed should be worn by all British, U.S. and Allied Other Ranks connected with Combined Operations. Would you like me to send you a supply of badges similar to this specimen so that they can be worn by the Ranger Battalions on the left shoulder? If so, would you be good enough to let me know how many you require. You may remember General Marshall gave approval for the Rangers and any personnel specially trained in Beach Party or assault signal work at "Dundonald" to wear this badge. (signed) Louis Mountbatten. 2 Sep 42 Americans applied for supplies of Combined Operations Badges. These badges were produced with the American Eagle replacing the original, embroidered in yellow on light blue backing. 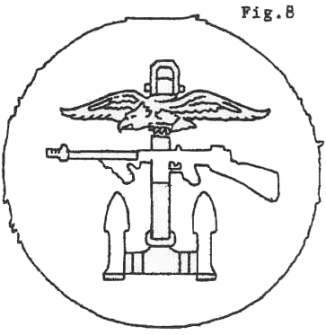 It was also reported about this time that the US Navy intended having their own version of the Combined Operations Badge, asking Mountbatten not to press them into having the same colour as those introduced by the American Army. The United State Navy Amphibious Forces badge was the same pattern, this time embroidered on a red backing. 8 Feb 43 It was reported that some members of the Royal Navy were arriving at the Combined Training Centre wearing what were considered unofficial badges, embroidered in gold or yellow. In fact it was intended that naval personnel were required to satisfactorily complete one months Combined Operations Training before being issued with the badge. Some of these badges were mentioned in a catalogue belonging to J & J Edwards Ltd, 99/100 High Street, Lowestoft. Gold wire Combined Operations Badge 11/6d, gold spun silk 2/6d and red silk 1/8d. Gold spun silk and red silk can be supplied by return post. Owing to the large number of badges being ordered in gold no more orders can be taken until the following month. 8 Feb 43 Extract. from a letter. I understand that the CCO recently gave permission to the ATS employed at Dundonald to wear the Combined Operations badge when he was approached by the senior ATS officer present. The ATS at Castle Toward hearing this have also put up the badge. The ATS personnel serving with Special Service Brigade are also wearing this badge. 11Mar 43 Instructions on the issue, purchase and wearing of the badges were displayed on the Combined Operations Headquarters Club notice board. 1 Combined Operations badges are now available at 2 pence a pair. 2 The sale is confined to Military Officers including (ATS), Other Ranks and Auxiliaries on the Staff of COHQ. 3 A free issue of one pair will be made to each Other Rank and Auxiliary and further pairs may be purchased through Junior Commander Lawrie, (ATS) and SQMS. Gillespie (Other Ranks). Officers can obtain their badges on repayment to TMDAQ, (Montague House, room 12). 4 Junior Commander Lawrie will make initial free distribution to Auxiliaries at a time and date to be notified. 5 Wearing of Combined Operations Badges is not applicable to Royal Navy, the Royal Air Force, the Women's Royal Naval Service and the Women's Auxiliary Air Force personnel serving at COHQ as they are not authorised under Admiralty or RAF regulations to do so. 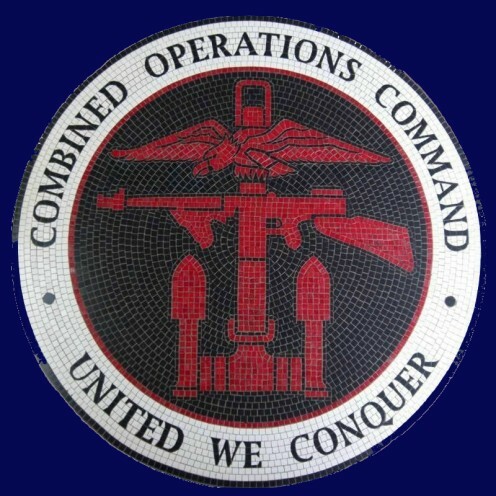 6 The Combined Operations badge will be removed on being off-posted from CCO's Command. 7 Method of wearing: The badge will be cut to form a circle 2.5ins in diameter and will be worn with the muzzle of the Tommy gun pointing forward at the top of both sleeves of the Service Dress tunic and Battledress blouse. The top of the badge will be positioned one inch below the shoulder strap seam. It will not be worn on the Greatcoat, on Khaki Drill or tropical shirts. The Arm-of-Service strip will be worn below the Combined Operations Badge and Regimental Flash below the strip. 24 May 43 15,000 Combined Operations Badges sent to Admiral H.K Hewitt, USN, United States Naval Forces, North West African Waters. I would like to make clear the correct positioning for wear of the badges pattern numbers 292A and 292B when worn on the Royal Navy blue jumper and the white uniform. Originally it was mentioned, that when the badge was worn on the front of the sleeve, the muzzle of the Tommy gun would point away from the body. There is a later dated instruction for 15 June 1944 in which it is actually mentioned that the muzzle of the Tommy gun would point to the rear. 17 Jun 46 Wearing of Combined Operation. Badge. The use of the Combined Operation Badge is to be discontinued with effect from 1 July 1946. This was the last instruction in the Combined Operations archive relating to the use of the Combined Operation Badge for the period 1942-46. The Combined Operations insignia lives on in the Joint Forces of today's armed forces (2014) in the UK, Canada and New Zealand. There are examples of these on our Insignia Specimen page. On this website see badge specimens, Insignia in Use and a short biography of the badge's designer, Lt D A Grant. (10/04) This RN cap tally below, and a similar "COMBINED OPS" one may have been approved by the naval authorities or was it unofficial? Either way does anyone know if it was worn? A photo of the tally in use would be very helpful. If you can shed any light on this please contact us (link at bottom of this page). Many thanks. The information above is a copy of an article entitled 'The Combined Operations Badge, 1942-1946' by Terry Carney based on research carried out at the Public Records Office (PRO), Kew, London. The dates are those found on the various PRO papers from which this information was obtained. (PRO now called The National Archive). The designer of the Combined Operations Badge was Douglas Adshead-Grant, son of the Rev and Mrs J Grant of Chichester. Born 1913(? ), died 28/01/56, Ashford District, Kent, aged 42. Rank; T/S Lt 19/4/40, T/A Lt 19/4/41, T/A Lt Cdr 01/45. Retired 04/46. Postings; 10/40 to 02/41. No appointment listed. 02/41 - 08/42 HMS Tormentor (Combined Operations base Warsash, Hamble, Southampton). 04/44 - 01/45 Experiments & Developments Branch, Combined Operations Head Quarters.